Bharat Ratna Lal Bahadur Shastri, who gave the slogen “Jai Jawan Jai Kisan”, a great freedom fighter, leader of Indian National Congress Party and the second Prime Minister of independent India. Shastri was born on 2nd October, 1904 in Mughal Sarai, Uttar Pradesh (British India). His father was a school teacher, but he passed away when Shastri was very young. Shastri’s mother took him to her parents home, Mirzapur. Because of poor financial condition, he used to walk 8 miles and swim across the Ganga river everyday to reach school and to avoid the expense of boat. Lal Bahadur went to Varanasi for higher education after completing his primary education from Mirzapur. He loved to read books of Guru Nanak Dev. In 1921, at age of 17, Shastri joined non-cooperation movement by Mahatma Gandhi, against British Government. He boycotted school and did not appear in examination. Because of his participation in this movement, all of his relatives except his mother were against him. Lal Bahadur was strictly against caste system, that’s why he dropped his surname. In 1926, he got the title of Shastri after completing his graduation from Vidyapeeth, Varanasi. In 1928, he married Lalita Devi. He refused to accept dowry as he was strictly against of this evil system. But because of continues pressure of his in laws, he only accepted a charkha and a few yards of Khadi. The freedom fighter became secretary of Congress Party in 1930. And in the same year he became President of Allahabad Congress Committee. He played vital role in Salt Satyagraha Movement and was imprisoned for two and half years in 1930. He was also imprisoned untill 1946, for active participation in Quit India Movement. Shastri was appointed as Police and Transport Minister in Pandit Govind Vallabh Pant’s cabinet and Parliament Secretary of Pant in Uttar Pradesh in 1947. Lal Bahadur Shastri was the first minister who used jets of water to disperse crowd instead of lathi charge as Minister of Police in Uttar Pradesh. In 1951, he was selected as General Secretary of All India Congress Committee. In 1952, he was appointed as Minister of Railways and Transport in central cabinet by Pandit Nehru. As Transport Minister, Shastri made it possible for women to become conductors in Transportation facility for the first time in India. He later resigned from post of Railway Minister after a train accident. 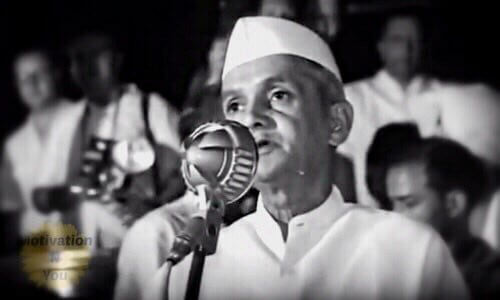 In 1961, Lal Bahadur Shastri became Home Minister of India. After the sudden death of Prime Minister Jhawahar Lal Nehru, Shastri became the Prime Minister of India in 1964. At that time, India was suffering from food shortage, droughts and poverty. Shastri appealed citizens of country to hold fast for a day in week. The credit for Green Revolution and White Revolution goes to him. The Food Corporation of India (FCI) and National Diary Development Board (NDDB) were also set up under his leadership. In 1965, India won war against Pakistan under leadership of PM Lal Bahadur Shastri. At that time of war and hunger, he came up with slogan “Jai Jawan Jai Kisan” (Hail the Soldier, Hail the Farmer) to encourage farmers and soldiers of nation. On 11th January, 1996, after signing the Tashkent Declaration, Lal Bahadur Shastri left this world under mysterious circumstances. The reason behind his death is still unknown. Lal Bahadur Shastri was the first person to be awarded with Bharat Ratna, The highest civilian award of India. In his memory, Vijay Ghat was established. Many roads across India, Lal Bahadur Shastri National Academy, Lala Bahadur Shastri Educational Trust were built after his name. Lal Bahadur Shastri was a man of action. He was widely known for his highest integrity, ethics and morality. In very short time with his broad minded vision, he made so many positive changes in India. He set some milestones which are still followed in our country. His leadership was admired not only in India, but also across the world.